Reposted here, not for the “medieval style’ pouch because the patterns aren’t sufficiently accurate, but for the use of the table fork as an awl. There’s a number of internal pockets and compartments missing when compared with the originals. Decorate to taste using the back of the butter knife as previously discussed. 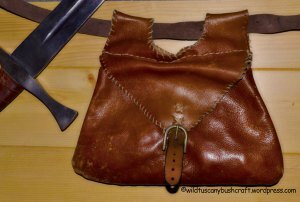 During the Middle Age was common carrying small items like coins, keys, inside pouches or purses attached to the belt. There are many archaeological and iconographical documents, you can search for your favorite patterns, but there is a model that in my opinion, is one of the best for a bushcrafter.